It’s Down With Cis Day! Here’s a thing that happened to one of my friends. I was there. Basically, we were walking down the sidewalk, talking about something meaningless. I think it had to do with a movie. Then this bus screeches up, stops next to us, and a bunch of people with “Down with Cis” shirts climbed out and started beating him up. I was punched and kicked a bit too, but I managed to avoid brutalization by going for their faces. After figuring out what’s happening, I started attacking them back, getting them off of him. He was quite injured but I called 911 and he made a full recovery at the hospital. I was fine, with only a cut on my arm that they patched up. It had to be a joke, right? If so, it went over the heads of people looking for reasons to hate trans folks. Tumblr user chandra-nalaar compiled “some highlights from all the people who believed the ‘down with cis’ post.” Follow that link at your own peril. Well, clearly FH didn’t expect anyone to believe that, right? Their post history (not linking to it) shows they are in fact an open transphobe, so what did they mean to achieve if it was a joke? The clear aim is to spread transphobia. Perhaps the laughably obvious lies from someone going by “foreverhonest” were meant to establish plausible deniability. Some people are transgender. Possibly oversimplifying, this means the gender they were labelled with at birth doesn’t feel right for them. Acknowledging this means we need a word for the non-transgender people, preferably avoiding words like “normal” which might make members of minority genders feel further ostracized. Science provides us with the prefix cis-, which is used in biology and other fields as the opposite of trans-. Thus, most people reading this are cisgender. Transgender people suffer from a truly appalling amount of discrimination and poor treatment, perhaps the bitterest from people who are progressive on other issues and should know better. The term for anti-transgender prejudice and systemic abuse is transphobia. Some cisgender people believe it is possible for transgender people to oppress them back. They call that cisphobia. Cisphobia is not real. A transgender person could literally say “I hate all cisgender people” and it would not constitute oppression. Why? Because a small minority of humans reviled by a huge amount of ignorant humans cannot in any meaningful way “oppress the oppressors.” Their scorn lacks the weight of an entire culture backing it, so it can’t cause harm in the same way. Just like christian fundamentalists in the US who think any laws short of xtian theocracy are somehow oppressing them, transphobes (often those same xtians) can become really committed to the idea they are threatened by violent trans oppressors. Hence the fictional gang of violent transgender people, inflicting violence on those they magically sensed were cisgender, at the start of this perverse tale. Every transgender person alive today has experienced a lifetime of transphobia and can experience incidents of it almost every day. Even those few who “pass” as cisgender completely can still have terrible feelings dredged up by the cisnormativity that completely saturates most cultures around the world. In this toxic transphobic world, cursing out your oppressor, just disrespecting the hell out of them in your own spaces, can be a needful emotional release for transgender people. Down With Cis – a phrase coined by a transphobe and put into the mouths of an imaginary violent transgender mob – is a delightfully short and punchy slogan for achieving that catharsis. Unlike the earlier “die cis scum,” DWC isn’t even violent. It went from being a tool of transphobic oppression to a meme for transgender empowerment. And so, without giving any thanks to the creep that unintentionally started all of this, let us celebrate International Down With Cis Day. If you’re transgender, nonbinary, genderfluid, whatever, grab a t-shirt and get on the bus. If you’re cisgender and leave a rainbow cake on your stoop at midnight while singing hosannas to Laverne Cox, the bus will pass you by. The rest of you? 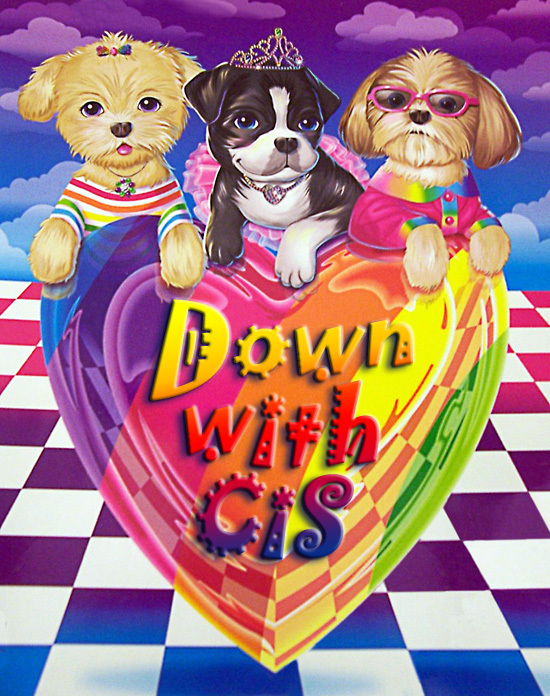 Down with cis! I remember there was a thread going around for a while where people were drawing undertale characters in “Down With Cis” shirts, and then it got swamped by people going like WOW YOU MISSED THE POINT NONE OF THESE CHARACTERS WOULD HATE CIS PEOPLE and it’s like chill out it’s a meme. That’s the one. I don’t know from fandoms, became aware of the meme from other sources. A lot of the people who freak out about DWC shirts also hate people expressing their trans headcanons, which is rather petty and transphobic in its own right. Well, I stayed up too late. Gonna have to moderate comments after noon. L8r! Man, this is way better than that Trans Visibility codswallop. I have to link you a few of my favourite of the down with cis images. – I am glad it is 5 days after the Transgender Day of Visibility and not before because then everybody would still be wearing their “Down with cis” shirts covered in bloodstains. I don’t even get most of the references, but that’s coo.